Burbank, CA – With the addition of major sponsorship from ilovekickboxing.com headed by Michael Parrella and funds from County Supervisor Michael Antonovich, has enabled the Martial Arts History Museum to include a variety of Asian cultural performances to its annual Dragonfest Expo in Van Nuys, CA. The Dragonest convention, now it is 12th year, is proud to feature the world famous Shaolin Monks troupe. The Monks, on loan from the Shaolin Temple in China, has been entertained the nation for the past twenty years. They have opened the doors to Chinese culture and tradition and have been wooing audiences with the unique aerial techniques and mind-blowing movement. Traditional Japanese Taiko drumming provided by Fumio Demura, will also be part of Dragonfest's stage performances. Chinese music as well as Hawaiian Hulu dancing will be appearing as well. In addition to stage performances, the expo will include some of the greatest anime artists in the world including Emmy Award Winning artists Christophe Vacher (Dreamworks), Paul Wee (The Simpsons), Jerome Lu (Star Wars) plus the Kano Kid and Eleazar del Rosario. The Dragonfest expo will feature a number of film stars including the Cobra Kai school from the Karate Kid films, major cast members of Big Trouble in Little China, members of the cast of TV's Kung Fu Series, Cynthia Rothrock from the China O'brien series, Don “the dragon” Wilson from the Martial Arts Kid, Carrie Ogawa-Wong from G.I. Joe 2, Phil Morris, Steve Oedekerk, Robin Shou and more. 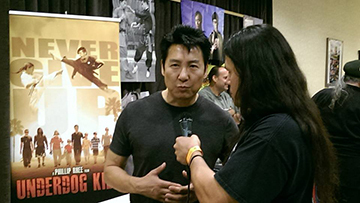 Martial arts icons include Douglas Wong, Benny “the jet” Urquidez, Leo Fong, Carl Totton, Diana Lee Inosanto, Malia Dacascos, Art Camacho and more. Tickets for the expo are only $25 at the door or early bird rate of $20 if purchased online before June 15. Visit MuseumDragonfest.com. Date is July 9 and begins at 11 am and ends at 6 pm. Dragonfest will be located at 7277 Valjean Ave. in Van Nuys, Ca. Kids are only $5. “Dragonfest is our biggest fundraiser for the Museum so I encourage everyone to support the Museum by attending this event,” adds Matsuda.